This article is about the Forerunner Moniter. For other uses of the term, see 343. "Last time, you asked me, if it was my choice, would I do it? Having had considerable time to ponder your query, my answer has not changed. There is no choice. We must activate the ring." — Guilty Spark to John-117. 04-343 Guilty Spark, initially known as Monitor Chakas and known to the Covenant as "the Oracle", is a Forerunner monitor that was originally tasked with maintaining Installation 04. Originally an ancient human known as Chakas, Guilty Spark played an important role in the ancient Forerunner-Flood war, as well as the modern-day Battle of Installation 04, the heretic uprising within the Covenant, and the events that transpired on the Ark during the Battle of Installation 00. Though originally believed to have been destroyed in the Raid on Installation 08, 343 Guilty Spark survived and began a search for the Librarian, a search that would lead him to seek out a new path for himself with the crew of the Ace of Spades and going simply by Spark. Prior to the end of the Forerunner-Flood war, 343 Guilty Spark was created from the mind of a human named Chakas. Born on Erde-Tyrene, Chakas unwillingly became involved in the Forerunners' schemes, which eventually brought him to Installation 07, a Halo under the control of the rampant AI Mendicant Bias which had defected to the Flood. Chakas' traumatic experiences on Installation 07, specifically his encounters with Mendicant Bias and the Primordial, brought him to the point of mental breakdown and left his physical body mortally injured. After retaking the Halo, the IsoDidact, in an apparent act of compassion, decided to salvage Chakas' mind by transferring his pattern—including his personality and the complete record of his physical body—into the shell of a monitor. Numerous archived human personalities retrieved by Composers after the siege of Charum Hakkor as well as other data pertaining to the Librarian's work were also uploaded into his memory. The monitor known as Chakas was then assigned to serve as a record-keeper and aide for the Librarian. He wished to look after the human populations on the greater Ark; this request was granted by the Librarian, who saw this as part of his recovery and a reward for his service. At one point, Chakas oversaw the construction of the outbreak management systems of the Flood research facilities within a gas mine over Threshold. When the Flood attacked the greater Ark in the final days of the Forerunner-Flood war, the Librarian asked Chakas to save as many of her specimens as possible. He attempted to get help from other monitors but they were busy with the attack. The Librarian ordered him to take a Gargantua-class transport to Omega Halo. Here he witnessed the Ur-Didact use a Composer on the human population, composing hundreds of thousands of men, women, and children. The Librarian was initially grief-stricken, but soon was able to tell Chakas he had to find the IsoDidact and go to the lesser Ark and hide the remaining specimens there. Following the Librarian's instructions, Chakas located the IsoDidact and saved him and Catalog from the disintegrating Omega Halo. Using coordinates provided by the IsoDidact, he took his ship through the Master Builder's secret slipspace portal to Installation 00. Amongst those rescued by Chakas were his old friends Riser and Vinnevra. "My galaxy is dead. I am machine. I am Chakas. I am human. I am 343 Guilty Spark. I have never understood Forerunners. And they will never understand me. But for now... Silentium." — Guilty Spark reflects on his nature as the Halo Array fires. Preceding the Halo Array's distribution across the galaxy, Chakas was commanded by the Ecumene Council to abandon all connection with his former station. As the installation monitors were being given their new assignments aboard a Lifeworker vessel stationed over the lesser Ark, the IsoDidact met with Chakas for one final time and the two had a brief conversation before they parted ways. It was also here that the installation monitors received their final names, with Chakas being assigned the name 343 Guilty Spark by the IsoDidact. The IsoDidact asked Chakas if he would fire the rings, were it his decision; Chakas remained silent, but would continue to ponder the Didact's question for the millennia to come. Over a hundred thousand years later, Spark would cite this query to John-117, whom he had evidently mistaken for the IsoDidact. From that point forward, Spark became the designated guardian and custodian of Installation 04. 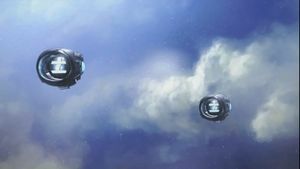 When the Array was activated, with Installation 04 being the first to fire, Spark received a signal from a nascent, previously-unknown civilization broadcasting its first transmission into deep space, and was saddened by the realization that they would be wiped out before they even had the chance to travel to the stars and make contact with other beings. At the same time, large portions of Spark's memory were automatically suppressed for the sake of compartmentalization as a precaution in the event the Flood and its ancilla-corrupting logic plague were to resurface. This caused him to forget much of his past life aside from the knowledge required in his duties as caretaker of Installation 04. Spark brooding over a desolate cliff on Installation 04. "Alone. Alone. Alone. Alone. Am I the only intelligence left? Waiting here on this ring for a rebirth never truly conceived. Guarding a weapon with no targets... A weapon I can tune to any target." — 343 Guilty Spark lamenting his loneliness and isolation during his prolonged post as Installation 04's caretaker. After the firing of the Halo Array as a last resort against the Flood, 343 Guilty Spark was alone in a galaxy void of sentient life. During the eons he spent monitoring Installation 04, he began to display signs of rampancy due to crippling loneliness, especially after communications with the other Installations had ceased. During his unintentional exile, he would begin to recollect his time spent with the Forerunner, their war with the Flood, decisions they made, and decisions he believed they should have made. During this time, Guilty Spark's mind fragmented considerably, becoming split among many separate personality-streams, partly in an attempt to contain and forestall the development of rampancy. After two cycles of hibernation, Spark found that he had become bored; something he had not believed he, as a monitor, was capable of. Aware of the risks involved with losing operational focus, Spark began to divert his attention elsewhere. For his own amusement, he began experimenting on his Installation, ejecting entire sections of matter from the ring's surface into space, intending to later rebuild them. Circa 40,000 BCE, an alien vessel crash-landed in Installation 04's Sector 1215. Though anxious to find answers for whether the Forerunners' plan to reseed life in the galaxy had been successful, Spark acted in accordance with protocol, blocking the distress signal sent out by the ship and not attempting to make contact with any possible occupants. No lifeforms exited the wreckage and the distress signal eventually terminated, offering Spark no answers. Afterwards, the monitor had a containment sarcophagus constructed around the ship. Disappointed by his failure to learn about the outside galaxy, Spark resolved to be more flexible in his adherence to protocol should outside life ever encounter his ring again. During his long isolation, Spark had little to no contact with other intelligent beings, and spent most of his time maintaining his installation. However, over time, Spark observed one or more spacefaring species visit Installation 04. These species landed on and explored the ring, recorded their findings and eventually left without breaching Flood containment. These interactions did not please Spark, leading to him threaten anything that came near the installation. By the time the ring was rediscovered by UNSC and Covenant forces, 343 Guilty Spark had been present on Installation 04 for 101,217 "local years", and during that time had conducted over one trillion simulated, and one actual firing of the installation. 343 Guilty Spark in Halo’s Control Room, along with John-117 and Cortana. "Oh dear. Containment protocols appear to have been violated." After over one hundred thousand years without a major incident, Spark was faced with a crisis when the UNSC Pillar of Autumn discovered Installation 04, pursued by the Covenant Fleet of Particular Justice. Fearing a containment breach, Spark warned the ship to jump at least one light-year away from the Installation or be destroyed. After remotely accessing the ship's systems, however, Spark realized that the ship was manned by Reclaimers after finding data on human history. He then deactivated the ring's defensive systems and instructed the ship to a docking facility - the Autumn crash-landed on the ringworld shortly afterwards. During the subsequent UNSC-Covenant guerrilla war, Covenant troops stumbled upon a Flood containment facility, and after unwittingly deactivating the structure's containment measures, they unleashed the long-dormant Flood that had been stored inside. As per his protocols, Spark began to search for a Reclaimer to activate the installation, and came upon UNSC Staff Sergeant Marvin Mobuto. Using the Installation's slipspace translocation grid, Spark brought Mobuto to the Library in an effort to retrieve the Activation Index. Ultimately, the ill-equipped Marine was overwhelmed and killed by the Flood, forcing the Monitor to seek out another Reclaimer. Spark and a squad of Sentinels moved to the Flood containment facility, where they encountered a group of UNSC Marines and John-117, who were battling the Flood outbreak. The Monitor recruited the Spartan for his purposes, who he quickly teleported to the Library and began guiding to the Index. With superior equipment and training, and despite overwhelming odds, this second Reclaimer succeeded in retrieving the Index. Taking the Index for safe keeping, Guilty Spark teleported himself and the Master Chief back to the Control Room. The Monitor explained that activation protocols forbid him from personally uniting the Index with the Core to activate the ring; only a Reclaimer could be permitted to do so. Spark gave John the Index, and urged him to activate the Installation. However, Cortana appeared and took the Index before it could merge with the Core, and explained to the Spartan Halo's true purpose. Spark confirmed this information, claiming that he had believed the Master Chief to have been fully aware of his role and responsibility as a Reclaimer. With the Index in the possession of a hostile AI and protected by a now uncooperative Reclaimer, the Monitor turned the Sentinels against the Master Chief in order to retrieve the Index. John-117 and Cortana escaped with the Index, with Spark and his Sentinels in pursuit. During their escape through the Control Room's adjacent tunnels, Master Chief disabled the three phase pulse generators, forcing their repair and delaying the Installation from firing in the near future. Disappointed, the Monitor followed John-117 and Cortana to the Pillar of Autumn, which they planned to detonate in order to destroy the ring. Intrigued by the abundance of knowledge within the ship's data banks, Spark briefly put aside his concerns for the Installation and began downloading information from the Autumn's computers, being especially interested in the sections pertaining to human history. He then disabled the vessel's automated self-destruct system to preserve the repository of knowledge he had discovered. Although the warship's engineering room was protected by many Sentinels, the Master Chief was successful in destabilizing the power cores. Realizing the implications of the ship's destruction, the Monitor immediately fled the doomed ring. Moments before the ring was destroyed, the Monitor consoled himself by asserting that he had done his utmost to fulfill his responsibilities. Later upon further reflection, when he was floating through space, Guilty Spark found himself happy as, ultimately, his purpose had been fulfilled: the Reclaimer had indeed succeeded in stopping the outbreak, even if it had been done in an "inelegant" fashion. 343 Guilty Spark discusses Halo's true purpose with Sesa 'Refumee. "Excellent! I believe I see assistance approaching..."
After Halo's destruction, Spark escaped into space, reflecting upon what had happened to both himself and his Installation. He then traveled to a Forerunner gas mining facility in Threshold's atmosphere, whose refitting as a Flood research facility he had overseen eons past. There, he encountered a Covenant artifact retrieval group led by Sesa 'Refumee. After a brief confrontation with several members of the lower castes of the Covenant, a Sangheili recognized him as an "Oracle" and took him to their leader. [note 1] Spark then proceeded to educate these soldiers about the true purpose of Forerunner creations, including the Halo rings. Exposed to the truth, Sesa 'Refumee took a new, critical view on the Great Journey and, gathering other similarly minded Sangheili and Unggoy, founded a new sect that denounced the Prophets and their Great Journey as false. Setting up a base in the gas mine over Threshold, the group would soon be branded as "heretics" by the Hierarchs. Such a state of affairs could not be tolerated for long by the Covenant and soon action was taken to eliminate the Heretics. This was accomplished quickly and quietly by the Arbiter and a team of special operations troops. In the aftermath, Guilty Spark was captured by Tartarus and given to the Prophets aboard High Charity. 343 Guilty Spark held aboard High Charity as Thel 'Vadamee and the Prophets discuss the Sacred Icon. Interrogated by the High Prophets, Guilty Spark revealed the nature of the Installations and the means to employ them, which made the Prophets send the Arbiter to retrieve Installation 05's "Sacred Icon". After it had been obtained, Tartarus took Guilty Spark and the Index to Installation 05’s Control Room, using Miranda Keyes as the new Reclaimer. However, Tartarus grew tired of Guilty Spark's constant warnings. When the Arbiter and Avery Junior Johnson arrived to deactivate the ring, they first questioned Guilty Spark, hoping that his status as Oracle could sway Tartarus to halt its firing. However, the Brutes were too loyal to the Prophets to accept the truth that the Halos were weapons of mass destruction. 343 Guilty Spark escaped Tartarus' clutches and observed the ensuing struggle, reminded of the one he had witnessed on the Pillar of Autumn. Keyes, Johnson, and Spark in Delta Halo's control room. After Tartarus and his Brute Captains were killed, the control panel for the Installation began to show a holographic display. 343 Guilty Spark translated the display to Johnson, Miranda Keyes, and the Arbiter: the rings were now on standby, meaning they could be activated simultaneously from the Ark. The Arbiter asked Spark where it was, and he provided them with coordinates to where he believed it to be located; unbeknownst to him, it turned out to be Earth, the human homeworld. Later that day, Spark and his allies rendezvoused with Rtas 'Vadum and the newly-formed Fleet of Retribution. Together, they formulated a plan for sterilization and quarantine. While the Arbiter, Keyes, and Johnson left Delta Halo for Earth, Spark remained behind to help coordinate containment efforts with 'Vadum and the fleet. On November 4, they, along with any friendly Elite ships would begin a campaign to cauterize the surface of the ring, destroying anything that attempted to slip away. At some point during the blockade, a single Flood-controlled cruiser escaped containment and headed for Earth. Spark joined part of the fleet as it gave chase. 343 Guilty Spark meets John-117 again in a Flood infested Voi. John-117: "On Halo, you tried to kill Cortana. You tried to kill me..."
343 Guilty Spark: "Protocol dictated my response. She had the activation Index, and you were going to destroy my installation. You did destroy my installation. Now I have only one function: to help you, Reclaimer, as I always should have done." — Conversation between John-117 and 343 Guilty Spark. On November 17, Spark and the Fleet of Retribution arrived over the Kenyan town of Voi, minutes after the infested cruiser crash-landed there. The Elites believed that the Flood vessel contained Cortana, last seen trapped on High Charity with the Gravemind. As Master Chief recovered the data module that stored her, Spark arrived in time to assist, destroying a Combat Form about to attack the SPARTAN and attempting to begin repairs on the unstable module. After a tense exchange between the two, they put aside their past and proceeded to bring the device back to their ship, where Spark completed his repairs. It turned out the device did not contain Cortana, but was merely a data core storing a holographic message from the AI. In her message, she claimed she had discovered a way to stop the Flood without activating the other Halo rings. In order to discover the answer, the Chief, Johnson, Keyes and the Arbiter, along with Covenant separatist forces traveled through the recently-opened Portal; Spark joined them. The fleet followed the Covenant forces through the portal, and arrived at Installation 00 - the real Ark. Largely unaware of the details of the Ark due to the compartmentalization protocols limiting his data stores, Spark aided the Reclaimers in their exploration of the Ark with enthusiasm. Spark's attempts to gain further access to the Ark's systems, however, prompted a response from the installation's custodian ancilla, which threatened Guilty Spark with lethal force if he persisted. Searching for Truth's location, the Sangheili located the Installation's Cartographer. Spark followed the Chief and the Arbiter's platoons to penetrate the wall protecting the location, opening doors and providing Sentinels as backup for the assault. Once the Cartographer was found, Spark used the map system to pinpoint the Prophet of Truth's location, but noted that the location was shielded by an energy barrier. At that moment, a loyalist Phantom arrived, driving the trio back deeper into the hallways. Spark led them towards Johnson's location a few floors below. After the reunion, Johnson was nervous at the sudden appearance of hundreds of Sentinels, but Spark reassured him they meant no harm and were part of a primary task force, although he couldn't discern their goal. UNSC and Sangheili forces moved to disable the shield barrier protecting Truth. However, as soon as the barrier was taken down, High Charity suddenly transitioned out of Slipspace above the area, nearly destroying Rtas 'Vadum's ship, and peppered the Ark with Flood dispersal pods and flaming debris. Terrified of a complete Flood takeover, Spark insisted that they focus their attention on the Flood. He was met with opposition from Keyes and the Sangheili leaders, who made it clear that their first priority was to kill Truth before dealing with the parasite. Once the Prophet of Truth was dead and the threat of the Halo Array neutralized, the Flood began their infestation of the Ark under the command of the Gravemind. Spark met with the Arbiter and the Master Chief after their initial escape, and discovered that the Ark had been constructing a new Halo ring to replace Installation 04. John stated that he planned to fire the ring, and Spark happily set about preparing the ring for its firing. After rescuing Cortana from the Flood-infested High Charity, Master Chief, the Arbiter and Sergeant Major Johnson landed on the newly constructed Halo. Spark aided their progress through the Installation by providing Sentinels to combat the Flood. Once the initial wave of Combat and Pure forms were destroyed, Spark opened the main blast door to the Control Room. 343 Guilty Spark mortally wounds Johnson in order to ensure the survival of the soon-to-be completed Halo, and the Ark. "Unacceptable! Unacceptable! That is absolutely unacceptable! Protocol dictates action! I see now that helping you was wrong! You are a child of my makers; inheritor of all they left behind. You are Forerunner, but this ring... is mine!" — 343 Guilty Spark turns on John-117 for the second time. Spark was reunited with the Chief along with Johnson and the Arbiter in the new Installation 04's control room, where he informed them that the ring was almost complete, but not yet ready to fire. However, despite Spark's panicked warnings that a premature activation would result in the destruction of the Ark (and, more importantly to Spark, the new Halo ring), Johnson ignored him, determined to destroy the Gravemind and the Flood once and for all. Unable to accept that his new installation was about to be destroyed, an enraged Spark fired upon Johnson as he attempted to activate the ring, mortally wounding him. Seeing John run towards his fallen comrade, the Monitor then fired upon him and the Arbiter, knocking the Arbiter out of the room and sealing the door behind him. The Master Chief was left to face the Monitor alone. With the Chief wounded and his shields down, Spark declared that he would stop at nothing to follow protocol and ensure the safety of the ring and the Ark. The Chief engaged Spark in combat, but was unable to damage the Monitor's housing. Johnson, burned and bleeding but still conscious, used his Spartan Laser to damage Spark before he could kill John, cracking the AI's protective casing. Johnson then gave his weapon to Spartan. Spark began to malfunction ever more erratically as the battle progressed, and after three more blasts from the Spartan Laser, he finally lost all structural integrity and exploded. Spark was not completely destroyed, however. In late November 2553, the UNSC detected a transmission from the ruins of Installation 00 and deployed the UNSC Rubicon from Luna to conduct a further investigation. A remote contact team recovered an extremely damaged armature, believed by the team to be the source of the signal picked up by the initial investigative group. The device was actually the broken, barely active remains of 343 Guilty Spark. After properly calibrating their AI translator, the human team began to interrogate Spark, hoping to gain insight into the ancient human-Forerunner relations and the Didact. Spark, acknowledging the humans as "the true Reclaimers" and claiming that his duty was to eventually testify to Reclaimers when given the opportunity, proceeded to describe the events that led to his former human self becoming a monitor. Over the course of his narrative, he constantly accessed the ship's information stores, breaching the firewalls without effort, much to the ONI team's dismay. As a result of the extensive damage he had sustained, Spark's memory was heavily splintered and barely functional; for example, he was unable to remember many of the preceding events, only learning of his recent interactions with the humans after tapping into their records. Spark explained that his mind had fragmented into a number of different identities over time and the incarnation previously encountered by the UNSC was merely one of his many selves. Large portions of information hidden from him after his assignment to Installation 04 had also been restored, allowing him to recount many of the details which had once been suppressed in the compartmentalization process. After Spark had finished his story, his robotic shell finally powered down and was jettisoned into space by order of the ONI team commander. Before this, however, he had successfully managed to upload his data stream into the ship's computers, disabled its AI, Curator, and took full control of the vessel. Having come to the conclusion that the Librarian was alive as a result of long study, and that he had need for the ship and its crew, Spark put them to sleep and set course to where he believed the Librarian could be found. Spark first attempted to take the UNSC Rubicon to the shield world known as the Etran Harborage to get an upgrade seed to better help prepare the ship for the journey ahead, unaware that the shield world had been destroyed in 2531 by the UNSC Spirit of Fire. However, there were complications following Spark taking control of the Rubicon and the ship crashed on the planet Geranos-a in the Ibycus system. Spark survived by creating an armiger for himself out parts salvaged by the crew from the Ark, but the crew died in the crash. Spark buried the crew in a mass grave and sent out a distress signal. Spark, now inhabiting an armiger carapace and Rion Forge. The recovery of a data drop in late 2555 containing the story Spark told the Rubicon crew as well as the recovery of the Bornstellar Relation on Sarcophagus made ONI determined to capture and torture Spark for all of the information they could get on the Forerunners and the Librarian. In 2557, Spark's distress signal was picked up by a cargo ship and relayed to ONI, but Spark was recovered by the salvage ship Ace of Spades first. Having repaired, combined or jettisoned most of his personality strings while trapped, Spark only retained the personalities of Chakas and 343 Guilty Spark. As a result, he adopted a more cooperative mindset where, while he was determined to complete his mission and not be imprisoned again, he would work with the Ace of Spades crew. Spark offered to help the crew recover their stolen salvage if they helped him find the Librarian, which they eventually agreed to. Niko later aided Spark in creating an avatar which enabled him to appear throughout the ship in holographic form rather than rely on using his armiger to interact in person. After a failed attempt to get an upgrade seed from the Etran Harborage and revealing the same story to the crew as he did the Rubicon, Spark took the Ace of Spades to the Forerunner planet of Triniel, whose population had committed mass suicide during the Forerunner-Flood war rather than let the Flood overtake them. Spark was able to get the slipspace flake he needed and created the upgrade seed. Though Spark initially activated the planet's communications satellites which would draw attention to it, he agreed to Rion's wishes and shut them down again so that the planet would forever remain lost, an undisturbed tomb of those who died there. Spark later attempted to access the Domain, but was denied access by Catalog, though he learned that the Didact had tried the same and also failed. Before disconnecting completely, Catalog told Spark that what he sought was not lost, it was already written and Spark just had to find it. In order to enact their plan, the Ace of Spades crew reluctantly let Spark upgrade their ship so they could match an ONI Prowler when it came for them. As part of the plan, Spark uploaded a splinter of his 343 Guilty Spark persona to a data core that was traded to ONI. However, when the crew came into danger, Spark exposed himself to rescue them. With the Ace of Spades new upgrades and with Spark having upheld his end of the deal, the crew took him to Mount Kilimanjaro where Spark used the fragment of himself in the data core to shut down the ONI base at the Portal at Voi, and search for information on Catalog's intrusions and the expired Catalog found on the African savannah. Beneath Kilimanjaro, Spark led the crew to a Lifeworker pod before revealing to Rion what he'd known for most of the time they were together: her father had died destroying the Etran Harborage. With the crew surrounded by Fireteam Apollo and an ONI team, Spark deactivated the light bridge for the crew before he entered the hard light beam around the pod and awakened a personality imprint of the Librarian stored within. The Librarian caused Spark to appear as he did when he was Chakas and addressed him by his human name. The Librarian expressed sorrow for the pain she had caused her old friend and told him that Spark was a singular marvel: a being that had adapted and evolved on its own, a product of necessity, but one that may have a great impact on things to come. The Librarian briefly told Spark of the awakening of her imprint on Requiem as well as that of the Didact, but did not elaborate further though Spark realized from her reaction that the Didact's threat was "not worrisome." The Librarian recognized that there were two sides within Spark: one that didn't care and was cold and scheming while the other cared and was all heart. Spark claimed to have no heart and asked about his friends Riser and Vinnevra. The Librarian recognized Spark's desire to bring back his friends and reminded him of his own experiences carrying the imprint of Forthencho, Lord of Admirals. The Librarian told Spark that his friends were at peace, their gene song quiet. Spark requested to be sent to the Domain where they were remembered, however, the Librarian cautioned against such a move, and when Spark then asked her to walk amongst the living as he did in an armiger, the Librarian refused, as she felt it was not time yet. The Librarian helped Spark to see that he had found friends again in the crew of the Ace of Spades who were in grave danger. The Librarian stated that she would go to join her other personality imprints at the Absolute Record while humanity had to be given the tools to uphold the Mantle and the knowledge to tend to the Domain. The Librarian offered Spark a choice: to remain with his friends or to go with her to the Absolute Record. The Librarian gave Spark a small etched box that she called a key for if he chose to remain and instructed that he "find what's missing. Fix the path. Right what my kind has turned wrong." After the Librarian admitted that the Didact was most likely beyond redemption, Spark announced his decision to stay with the friends he had waited one hundred thousand years to find and promised to meet the Librarian again before she departed for the Absolute Record. As she left, the Librarian communicated with Rion at least and in her message, the Librarian instructed Rion to take care of Spark who is more fragile and important than she could ever know. "I have waited one hundred thousand years to find my friends. Why would I leave when I have found them?" — Spark chooses a new path. Upon emerging from the hard light beam, Spark shifted his armiger into a combat configuration with a hard light rifle which Spark used to bring down the roof of the cavern and force the Spartans to retreat. Spark led the crew onto the platform where the Librarian's pod had been which also acted as a translocation pad and teleported everyone to safety outside where Spark was able to remote-pilot the Ace of Spades to pick them up and cloaked them from military detection while pulling his fragment from the ONI systems. Awhile later, after Rion woke up, Spark approached her to offer an explanation for his lies regarding John Forge's fate. Spark explained that he could not bear to bring her the pain of the truth and explained that he had gained much data from the species of the Covenant and humanity during his interactions with them. When Spark came aboard the Ace of Spades, he went through its data and the name of the UNSC Spirit of Fire had triggered an echo of memory that had taken Spark several days to figure out. Spark revealed that the Spirit of Fire had preprogramed maintenance sheds and data drops in hopes of leaving a trail and in those, Serina had left a message for Rion as part of a promise to her father from the AI and the captain. Spark was then able to provide Rion with her father's message. A week later, the crew holds a funeral for John Forge with Spark singing and using it to let go of his friends. Confronted by Rion, Spark admitted his desire to access the Domain with the Librarian's help to find the ghosts of his friends and bring them back or join them before everything that had happened changed his mind. Spark would only state that the Librarian had given him a coordinate key to a safe place and volunteered to act as the new shipboard AI of the Ace of Spades, promising that there would be no more lies. After they departed Earth, the crew discussed their options with Gek 'Lhar's bounty still on their heads and ONI after them because of Spark. Rion decided to continue their mission to find the Spirit of Fire which Spark expressed confidence that they wound find. The crew decided that they would have a wealth of options to choose from after that and each raised a toast with Spark's being "to friends." "Clearly, in my thoughts-in truth-this monitor is much more than a machine." — The IsoDidact on Guilty Spark. Over the eons spent monitoring Installation 04 in solitude, 343 Guilty Spark longed for a Monitor companion to combat his loneliness, and to help him stay focused on his duties in the wake of early rampancy. After a hundred thousand years of isolation, 343 Guilty Spark was quirky, detached and analytical. For Spark, protocol dictated all; the slight emotion he showed for the death of an ally was truly grief only for the inconvenience of finding another to assist him. While he gladly assisted those who requested his help, if his allies decided to prevent him from completing necessary actions - such as the firing of his ring - he would turn on them without hesitation and dispatch them with lethal force. Tens of thousands of years of monotonous duty spent monitoring his installation and waiting for a Reclaimer appeared to have had a significant effect on the Monitor's sanity. Spark showed many characteristics of rampancy. He loved to learn and to take records, even in the face of his installation's imminent destruction; accessing the Pillar of Autumn's shipboard databases, he was intensely fascinated about finally having access to human history up until that point, referring to the record as "all of our lost time." He also showed other odd behaviors such as humming and singing. Typically, he was also untroubled with matters of life or death. When Sesa 'Refumee and Tartarus were killed by the Arbiter, he appeared casual, although he was remorseful when Sesa 'Refumee was killed. Spark's detachment resulted in a tendency of rarely giving more information than he had to. For example, on Installation 04 he merely told John-117 that activating the ring would stop the Flood, neglecting the portion about how all life in range of the ring would be wiped out to do so (although he may have been genuinely unaware that the Master Chief was completely oblivious to any of this, assuming the Spartan to be the IsoDidact). Likewise, he did not tell the High Prophets that the ring was a weapon when asked about the location of Installation 05's Index, only telling that truth to the Covenant when asked directly by the Arbiter. While bound by protocol, Guilty Spark seemed to genuinely enjoy the prospect of firing the Halo Array, unlike his fellow Monitors such as 049 Abject Testament. Although created from the essence of Chakas, 343 Guilty Spark became his own entity after his conversion into a monitor, often referring to his past human self as a separate being despite retaining Chakas' memories. This was the result of a number of factors, including the combined wisdom of the numerous human essences stored within his reborn self, the immense amounts of added knowledge and programming to enable him to effectively perform his duties, as well as the mental trauma Chakas suffered in his human form; he himself stated that he "went mad". The suppression of most of his memories and knowledge upon his assignment to Installation 04 in the name of compartmentalization further diverged him from his original self, in addition to his primary personality array splintering to numerous fragments over tens of thousands of years. However, many of his ancient memories from prior to his post at Alpha Halo resurfaced after his physical shell was severely damaged and subsequently reactivated by a UNSC science team for interrogation; thus, this entity was closer to his original persona of Monitor Chakas than his previously-encountered incarnation hamstrung by compartmentalization protocols. 343 Guilty Spark revealing the Ark's purpose. As a Forerunner AI, 343 Guilty Spark possesses highly advanced abilities with electronic systems; even in his highly reduced, damaged state, he was capable of effortlessly breaching the numerous firewalls and other safeties of the UNSC Rubicon, a highly secure ONI vessel. In the conclusion of the interrogation, he subdued the ship's AI and took complete control of the ship, having uploaded his data stream into the ship without the crew initially noticing. As with UNSC and Covenant artificial intelligences, Guilty Spark's programming prohibited him from carrying out certain actions. He cannot, for example, retrieve the Activation Index from the Library or use it to activate Installation 04, instead requiring a Reclaimer to carry out this task. Spark's protocol bound him only to contain a Flood outbreak from Installation 04, so when Installation 04 was destroyed, his directives were also terminated. This means that he no longer had a priority prescribing his actions concerning the Flood - he was free to make choices concerning the Flood, as he did on Installation 05 when he assisted in the deactivation of its firing sequence, risking the containment of a Flood outbreak. According to Spark, the loss of his ring left him with only one purpose: to aid the Chief as a Reclaimer, which Spark admitted was something he should have done from the beginning instead of trying to hinder him. This caused the two to put aside their differences and Spark to join forces with the Chief again against the Flood and the Covenant. Due to his abilities in connection with the Halo Array, Spark proved to be a powerful ally and seemed to take commands from Commander Keyes, Sergeant Johnson and the Master Chief without hesitation as part of his new function in life. When he discovered Installation 08, his priority protocol reactivated, and he adopted the ring as his replacement. When Sgt. Maj. Johnson declared his intent to fire the Halo, which would destroy it, Spark unhesitatingly killed him. Despite his treachery, it is unlikely the UNSC would have been able to prevent the premature activation of the Halo Array without Guilty Spark's assistance. After three years trapped on Geranos-a, Spark was able to repair, combine or jettison many of his personality strings until only Chakas and 343 Guilty Spark remained. After being rescued by the Ace of Spades, Spark found himself remembering more and more of what it was like to be human and found himself horrified at what he had become as 343 Guilty Spark. Spark adopted a personality that was something of a mix between the two while acknowledging his past mistakes, at one point telling the Ace of Spades crew that he didn't make a good impression upon the human military while he was a monitor and neither did others of his kind. Instead of going by Chakas or 343 Guilty Spark, he preferred to simply be called Spark, a nickname given to him by the crew of the Ace of Spades. After his encounter with the Librarian's personality imprint, Spark gave up his efforts to bring back or rejoin his old friends, instead accepting that the Ace of Spades crew were the friends he had been searching 100,000 years for. Spark showed compassion for Rion Forge, refusing to tell her the truth about her father at first not just so that she wouldn't stop helping him, but because he couldn't bear to bring her the bad news. After telling her the truth, Spark did her a further kindness by giving Rion the message he had discovered recorded by John Forge for her. Additionally, while he at first planned to use the communications satellites on Triniel to communicate with the Domain, Spark stopped them from rebooting when it was realized that doing so would draw attention to the long-lost planet. In doing so, Spark showed compassion for the hundreds of millions that committed mass suicide on Triniel to avoid falling victim to the Flood by leaving the planet untouched by further mass exploitation, something that the human crew also wanted for the planet. As Spark, he seemed to have lost much of the violence he possessed as 343 Guilty Spark, purposefully aiming to collapse a cavern in a way that would not harm anyone as a distraction rather than using his formidable firepower to try to kill attacking enemies as he did with Johnson and the Master Chief on Installation 08. Having accepted his new purpose, Spark was happy to settle into life as the Ace of Spades shipboard AI. The Librarian herself called Spark a singular marvel, a being that evolved on his own out of necessity and one that may have a great impact on things still to come. While speaking with Rion, the Librarian asked her to take care of Spark as he is more fragile and important than she could ever know. Check out our collection of quotes related to 343 Guilty Spark in its quotes page. 343 Guilty Spark was voiced by actor Tim Dadabo. The only person who ever refers to 343 Guilty Spark as "343 Guilty Spark" is himself, when he is introducing himself. Others refer to him as "The Oracle", or "The Monitor" when speaking of him, or even shorten his name to "Spark", or once "Robot", to which 343 Guilty Spark protested against, and also "Tinker Bell" by Avery Johnson in Halo 2 after he asks about where to activate the rings while in standby mode and answered sarcastically. He has also been called "Light bulb" by Johnson in Halo 2 (to Tartarus: "Please...Don't shake the light-bulb.") and Halo 3 ("A tank's a tank, light bulb."). 343 Guilty Spark is the only significant enemy character that appears in person in the last level of each game in the trilogy (excluding cutscenes). After the Halo: Combat Evolved credits, the tune he hums is a portion of the Halo theme. Occasionally, in Halo 3, he will hum some parts of the Halo Theme. In the cutscenes of Halo 2, when 343 Guilty Spark talks his light glows brighter, but during gameplay in Halo 2 when he talks his light grows dim. This is a programming glitch, where he was supposed to do the opposite, and is referred by Joseph Staten as "the most terrible glitch in Halo 2... and nobody cares about it." In Halo 3, if the player kills his/her fellow Marines or teammates on Co-op, 343 Guilty Spark will sometimes become hostile and fire his laser at the player, and, despite having to fight him while he uses it later on, is much more powerful and can easily kill the player in one hit, even while in a Scorpion Tank. 343 Guilty Spark shoots a beam similar to both the UNSC Spartan Laser and the Forerunner Sentinel Beam. When comparing power through hacking or modding, the beam is noticeably weaker than a Spartan Laser but much stronger than a Sentinel Beam. In the final level of Halo 3, just before 343 Guilty Spark dies, he will make random statements such as Gollum's catchphrase from Lord of the Rings: "My Precious!" This is likely because Halo is also a "ring of great power", just like the Great Ring that Gollum possessed. Other similarities to the Lord of the Rings include that Guilty Spark is an ally for most of the third game, but turns against the main characters at the end, dying to try and stop the protagonists from destroying his beloved ring. Players can gain an Xbox Live Avatar prop representation of 343 Guilty Spark just by using Halo Waypoint on the Xbox 360. The Disembodied Soul, when asked about Guilty Spark, claims that "He's my progeny. He inherited my good looks and pleasant personality." On the Firefight level Installation 04 he can be seen behind a transparent wall in the bunker near the cliff. He will float up to the door backwards and turn around to face outside. When standing in front of him the prompt "Hold x to take ally's..." and the icon for the Focus Rifle appears however you can't actually take it. In Halo: Combat Evolved Anniversary, there is a small covering on the top part of his eye. This covering is not present in the original game or in his appearance Halo 2 and Halo 3. It is also not present when he appears in the terminals nor seen on any other installation monitor shown. When it is present it makes him look quite sad or depressed. It is unknown why this change in design was made, although it may hint to his descending rampancy or loneliness. This covering can also be seen on the forge monitors when playing Forge on maps of the Anniversary Map Pack. 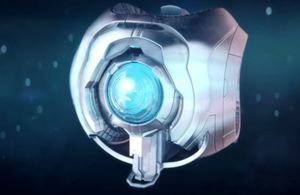 In the Halo 2: Anniversary cinematic cutscenes the light in Guilty Spark's "eye" moves around when he talks to other characters. Guilty Spark appears, in his Halo 2: Anniversary form, in Rocket League as an unlockable antenna for the base cars to use. In Halo: Combat Evolved and 3, the "eye" of 343 Guilty Spark bears the Marathon logo. Also, there are notable similarities between Guilty Spark and Durandal; both are able to teleport the main character, and ended up rampant. 343 Industries, Microsoft Game Studios's internal-build team tasked with managing the Halo franchise, is named in reference to 343 Guilty Spark. Guilty Spark's single round eye is a reference to HAL 9000 of 2001: A Space Odyssey. Like HAL, he is obsessed with protocol to the point of attacking the humans he is partnered with. In personality, however, he is HAL's polar opposite. 343 Guilty Spark's avatar icon as seen in the terminals of Halo 3. 343 Guilty Spark in Halo: Combat Evolved. 343 Guilty Spark in Halo: Combat Evolved Anniversary. Note the changed Marathon symbol. 343 Guilty Spark in Halo 2. 343 Guilty Spark in Halo 3. 343 Guilty Spark in the swamps of Installation 04. 343 Guilty Spark with Sesa 'Refumee in Halo 2. Tartarus captures Guilty Spark before retrieving the Arbiter for departure. 343 Guilty Spark held captive within a Containment field device by the Covenant. 343 Guilty Spark carrying Avery Johnson during flight. 343 Guilty Spark gathers with UNSC and the Fleet of Retribution to unlock Cortana's message. 343 Guilty Spark within the Cartographer of the Ark. 343 Guilty Spark in his defense mode as indicated by the change of color in the eye sockets. 343 Guilty Spark heavily damaged. 343 Guilty Spark as depicted in Halo: Combat Evolved Anniversary. 343 Guilty Spark communicating with a Covenant AI. 343 Guilty Spark kills an attacking Kig-Yar in the Threshold gas mine. Guilty Spark with Miranda and Johnson on Installation 05. Spark, inhabiting an Armiger carapace, alongside Rion Forge, on the cover of Halo: Renegades. The Guilty Spark Antenna in Rocket League. ↑ In the Halo Waypoint video The Long Road Home, it was originally stated that 343 Guilty Spark had been captured by Sesa Refumee's soldiers after the Battle of Installation 04. However, the eleventh Terminal of Halo: Combat Evolved Anniversary later revealed that the Monitor was quickly accepted among the Covenant, even after killing two Kig-Yar. 343 Guilty Spark was not captured but rather welcomed as an Oracle.